Godefridus Maria Leeuwenberg was born in a catholic family on Amsterdam on April 13th 1899. Little else is known about his youth, except that he moved to Delft in 1917 coming from Nijmegen. In 1920, as a student in Delft, he served as treasurer of a catholic fraternity. 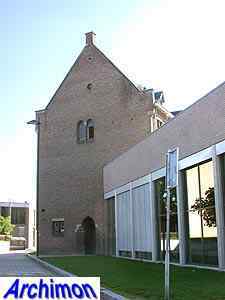 In 1926 he finally graduated as an architectural engineer at the Delft technical college. A year later he held an exposition of the sketches he made during a study trip in southern France, which was shown in Den Haag, Amsterdam and Nijmegen and perhaps more cities. Around the year 1930 he settled in Utrecht. He was a member of the board of architects' organization BNA as well as, from 1931 until 1939, a regular contributor to the catholic architect's magazine R.K. Bouwblad. 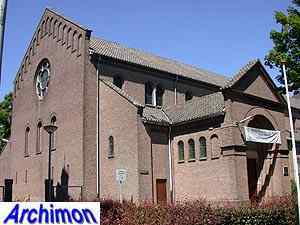 From 1935 until 1966 he was a member of the Utrecht city counsel for the catholic party RKSP and its successor KVP. Leeuwenberg's first works are probably all of a profane nature. They include a block of houses in Nijmegen and a building for a firm Leeuwenberg in Amsterdam, possibly relatives of his. Likewise, an uncle of his, P.J.M. Leeuwenberg, was one of the owners and directors of the Simplex car and motorcycle factory, for which he designed a new building in ca. 1936. 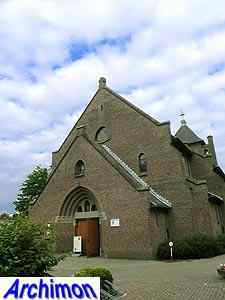 Between 1933 and 1964 Leeuwenberg designed a number of catholic churches, as well as other buildings for the catholic community, always working in Traditionalist styles. His profane buildings later in his career show influences of Functionalism. He was also involved in several restorations of medieval churches. He died in Utrecht on April the 7th 1967. His office was continued by J.L. Volders with the name Leeuwenberg & Volders. The following is a list of his religious works only and is probably incomplete. Enlargement of a medieval church. The Gothic choir was replaced by a large christocentric transept with a built-in, tower-like choir, resulting in a T-shaped ground-plan. Inside, the pillars and most of the vaults were removed. The entire church was destroyed in World War Two. Three-aisled pseudo-basilica in Traditionalist style. Design to extend the Gothic St. Catharina with a big cathedral in Neo-Romanesque style. 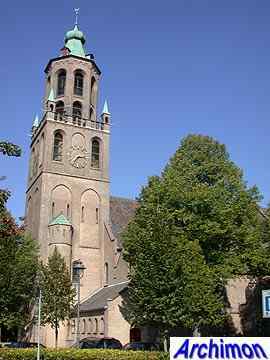 Front with two towers, tall crossing-tower. not executed. Van Leeuwenberg was in charge of a major restoration a few years later. Three-aisled basilica in a Traditionalist style. Towerless three-aisled pseudo-basilica in Traditionalist style. Designed in conjunction with C.A. Hardeman. 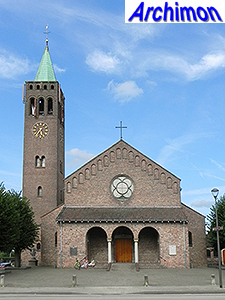 Three-aisled basilica in a Traditionalist style, with tower and apse completed in 1961. Three-aisled basilica in a Traditionalist style with a long nave. Three-aisled basilica in a Traditionalist style, inspired by Romesque. The church replaced a neo-Romanesque church (H.J. Wennekers, 1866-1867), the tower of which was incorporated. Church in a modern Traditionalist style. Demolished in 1998. Replacement of a neo-Classical church of which the facade was incorporated in the new church. By Leeuwenberg & Volders office; G.M. van Leeuwenberg possibly involved with the design before his death.